Photo Reflection of the Day #233: Hobbits on Skis? An advertisement in the Wellesley News from 1967. In my History of Higher Education course, we were given some primary sources to explore and my group ended up with the Wellesley News, the newspaper of Wellesley College from 1967. There was all sorts of interesting features, but this is the one I found most striking. 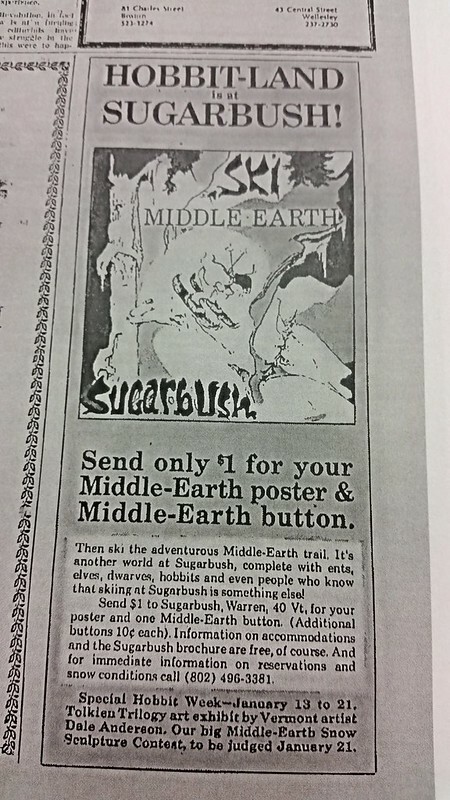 Apparently, Lord of the Rings was popular and interesting enough for a ski resort to make part of their skiing paths into something related to the series. In fact, it never even mentions Lord of the Rings, and never mentions The Hobbit as a book. It's interesting to think the novel was that popular in the late 1960s that a ski resort would not only hire someone to make the sculptures but advertise epic fantasy to women (who have often been an ignored demographic of the genre).